As a child, Gretchen’s twin sister was taken by a witchlike monster in the woods. Ever since, Gretchen and her brother, Ansel, have felt the long branches of the witch’s forest threatening to make them disappear, too. When their stepmother casts Gretchen and Ansel out as teens, they stumble upon the sleepy Southern town of Live Oak and are invited to stay with Sophia Kelly at her sweetshop. Sophia molds candied magic: coveted treats that excite confidence, bravery, and passion. Life seems idyllic, and Gretchen and Ansel gradually forget their haunted past – until Gretchen meets handsome local outcast Samuel, who gives her a reason to fear Sophia: Girls have been vanishing at Sophia’s annual chocolate festival, taken by the insatiable “witch” of Gretchen’s nightmares. Can Gretchen save herself, the girls of Live Oak, and Sophia? Of one thing Gretchen is certain: a monster is coming, and it will never go away hungry. I highly enjoyed this companion novel to Sisters Red! I was expecting a companion set in the same world but quite different, and instead I got a crossover character and more werewolves. Awesome. When Gretchen was younger, she, her brother Ansel and her twin sister go walking in the woods. Only Gretchen and Ansel come home. Gretchen is convinced it was a witch that stole away her sister, and when their stepmother kicks her and her brother out of the house, Gretchen wants to head for the ocean – as far away from the forests as she can get. Car trouble sees the siblings stopped in Live Oak, where they find themselves living with mysterious chocolatier Sophia, and Gretchen realizes the witch may not be quite what she expected. The story isn’t so much about the witch and discovering what happened to Gretchen’s sister, as it is about Gretchen finding peace and realizing she can be strong. Thinking she was getting away from the witch of her past, Live Oak and Sophia just make Gretchen see that she is not alone. Girls have been disappearing from Live Oak, leaving without a word. Gretchen sees herself, sees her sister, in these girls and comes to understand that there is a witch – it’s just not a witch. It’s werewolves. A run in with hunter (and woodsman!) Samuel helps Gretchen to understand that she needs to face her fears, and not keep running from them. Gretchen comes to a lot of realizations throughout the story, and her relationships with Sophia and Samuel are the catalysts for a lot of them. Quite a bit of paranormal violence in this one, but it’s secondary at best and not a highlight of the story. While I got a bit of a “grab a gun and kill things to overcome your fear and be strong”, I know that it is not the message of the story, and that killing the wolves is just Gretchen’s way of proving to herslef that she can help make a difference. Becoming strong is in her more subtle actions: not running away, speaking about her lost sister, confronting Sophia whom she sees as a sister. In these ways, Gretchen proves her stability and strength. 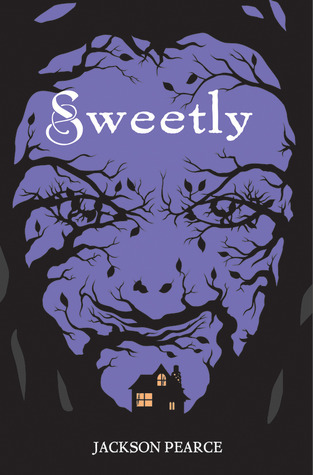 Sweetly is a great retelling and twist on the Hansel and Gretal fairy tale, and a welcome addition to the Sisters Red family. Thank you to Nicole at DogEar for sending me a copy to read and review. Thank you! I’ve been wondering about this one. Glad to see that there’s more on offer than just a fairy tale retelling. I’ll keep it in mind (and probably look for it at the bookstore…). Nice review!